Great write-up. I love slide guitar and McDowell is one of the best. Selected cuts from this same show were released on Tomato LP "Shake 'Em On Down" from '89, tho minus "Red Cross Store" weirdly enough. A great record and all, but I say Chris Strachwitz got the best Fred McDowell recordings, released on those early Arhoolie LPs, with Johnny Woods playing harp on a few songs. Bob, those recordings are great, too. I wouldn't argue with you. The story about tracking down Johnny Woods for those recordings makes them sound even better. 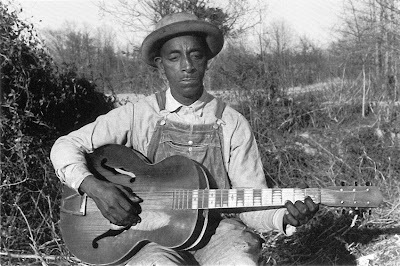 The late English folk singer Peter Bellamy had a lovely story about Fred McDowell. During one of Fred’s visits to Europe he was sitting talking with Peter in an empty theatre, while the stage was being set up for a concert. Peter’s wife Anthea came in to join them, at which point Fred leapt to his feet to offer Anthea his seat. Every other seat in the thousand seater auditorium was empty, but Fred made sure that Anthea got his. As Peter said – the ultimate gentleman. Hey, look Fred McDowell in the grave...it was a freemasson? Thanks, Ted. What a great artist & what a great post. Thanks for this one. All the best & safe travels, Fritsch. Where'd y'all find this obscure southern blues scholar Simonelli? Damn...When's a serious summary of Humble Pie's Rockin' The Fillmore coming? That Gaslight CD has been made available for free download over on animation producer Fred Seibert's website. He was one of the producers on the records and co-owner of oblivion records. Lots of info on the recordings there. Also scroll through this page for more info on the recordings. As the previous comment said, a great right up - however, it's spoilt by the lack of respect you've shown by placing Fred's death picture online. 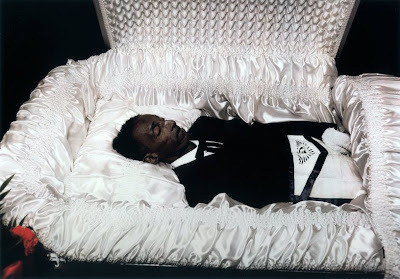 The 'death picture' is a photograph by Memphis artist and friend of Fred McDowell, William Eggleston, which has been exhibited in museums and published in several monographs. It's a dignified photograph, and we reproduce it here with respect to the artist and the subject. thanks you for all your great posts.